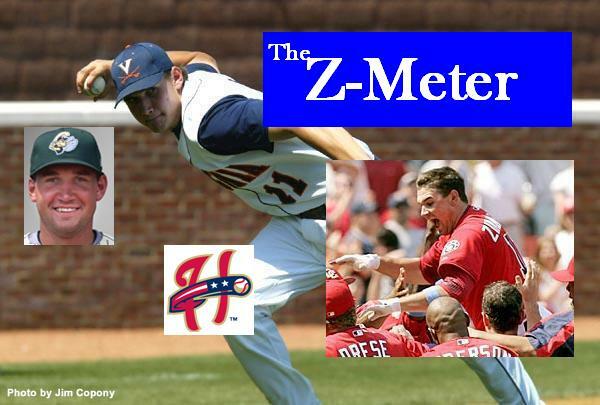 The Z-Meter: 7/27/2009; Jhoulys Ascendant! As Brian reported earlier, Jhoulys Chacin has been called up from AA Tulsa to the big club in Colorado. As happy as I am to see one of my favorite Bus Leaguers move up, I have to question the way it was done. The Rox have just taken a young guy from the smothering heat and humidity of Oklahoma directly to the dry altitude of Denver. Had Jhoulys been able to make a couple of starts in AAA Colorado Springs, he might be a little better prepared for the way his ball is going to move, or, as the case will most certainly be, not move. But to hell with that stinkin’ thinkin’. Go get ’em, Jhoulys! In other news, I’ve officially given up on Shooter Hunt. The balls-out amusing name was not enough to save him when his rehab stint in the Gulf Coast League turned into a further demonstration of how he just can’t pitch. 0-4 with an ERA over 9.00 is more than I can take. He’s gone. So, welcome two new members. Eddy Martinez-Esteve, who has the triple-bonus of 1) a lengthy, hyphenated last name that stretches across his entire jersey like a rainbow 2) I saw him play in college when FSU won the ACC tournament in Salem, VA and 3) is actually pretty damn good. Also, Travis Wood, who maintained a 1.21 ERA with 103 Ks with the Carolina Mudcats, which earned him a post-break promotion to AAA Louisville. Travis, you’re our first L’ville Bat since “The Deal”, so be gentle with us. Strasburg was the #1 pick in the college draft this season, and will join the Washington Nationals system any old day now. He remains here as an honorary member. OK, this is exactly why I put Jamie McOwen on the Z-meter. The Natinal media are off his case now that his hit streak is over, but HE’S STILL HAVING AN INCREDIBLE YEAR! So he’s staying. Kila Kaiihue – 63 walks. It’s nice to see a slugger who is willing to take the free base when it’s offered. And it seems to be offered quite frequently. Good eye, Kila! Carlos Carrasco – 90 strikeouts. This poor guy is having an up-and-down season, despite blowing hitters away. Pedro Alvarez – Since his promotion to AA, he’s hitting .200, but that includes three homers in 12 at bats. Brad Brach – The meter’s designated closer has only walked seven batters in 37 late-innings appearances, which is why he’s at the 20 save plateau already this season. Che-Hsuan Lin – His start was disastrous as he hit well below the Mendoza line. He’s inching his way back to average, and has somehow contributed 18 steals despite his early difficulty getting base hits. Another “Don’t Panic” award goes to Maurico Robles, who has adjusted quickly to the Florida State League. His first start yielded a 16.87 ERA. His second, 6.00 with ten strikeouts. On Independence Day, he buckled down to pitch 6.2 innings with a sterling mark of 0.00. It’s going to be tough to continue that trend. No good deed goes unpunished. After hitting over .300 in Frisco, Rangers prospect Justin Smoak got the callup to Oklahoma City, which belonged to current major-leaguer Nelson Cruz last year. Can Smoak replicate Cruz’s feat? Not soon. He’s currently hitting .077 since making the leap. Shooter Hunt, he of the 10.70 ERA at Beloit, is down in the Rookie-level Gulf Coast League on a “rehab assignment”. He’s currently 0-2 with ten walks at the kids’ table, so he might just be there for a while. If so, don’t expect him to hang around the meter much longer. Zeke Spruill hasn’t won a game since late May, though he still sports a fairly decent 3.02 ERA. The kid’s not catching many breaks, though. He only gave up one earned run vs. Augusta, but that was enough to give him the loss. Yesterday, it was eight scoreless innings and a spotless ERA, which was only good for a no-decision. In closing, I want to add one more player to the meter. I’m going to leave Stephen Strasburg in his honorary spot at the bottom of the meter, but I’m going to actually start tracking someone who’s picking up stats. In fact, I’m adding OMDQ’s hitting savant James McOwen, so we can continue to watch him even if his streak ends. We owe him that much. Still not a lot to see here. Many players are coming off of mid-season injuries, some all-star games have been played, and a couple of players have made jumps. One amusing side-note, however. Justin Smoak, who spends most of his time with the Frisco Roughriders, recently spent two games with the Arizona League Rangers while rehabbing an injury. In two games and six at-bats, Smoaky managed a slugging % of 2.000, and an OPS of 2.714. I’d say he’s feeling better. Our primary mover this week was Pedro Alvarez, who’s steaming toward Pittsburgh as fast as he can. His power numbers in Lynchburg earned him a promotion to Altoona. Mauricio Robles made a small leap from A to A-Advanced, which is actually interesting, since he was coming off an injury. Usually, don’t you rehab at a lower level? 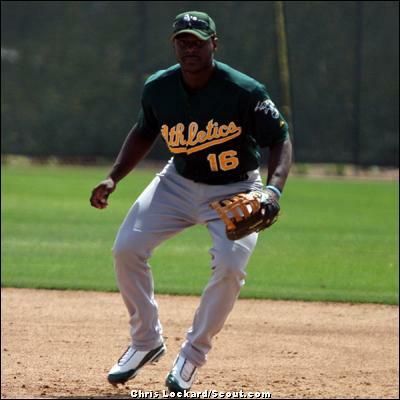 We’ve also noticed that Michel Ynoa has been assigned to the AZL Athletics, but hasn’t accrued any stats yet. We’re dying to get him on the meter, so we’ll keep an eye out. Strasburg was the #1 pick in the college draft this season, and will join the Washington Nationals system any old day now.